After a fun, relaxing week of vacation, it feels good to be back home! Even though I was on vacation, I did do some baking and this Strawberry Upside Down Cake topped with Nutella is one of the cakes I made for our families 4th of July party. And it really is true that Nutella makes everything taste even better. 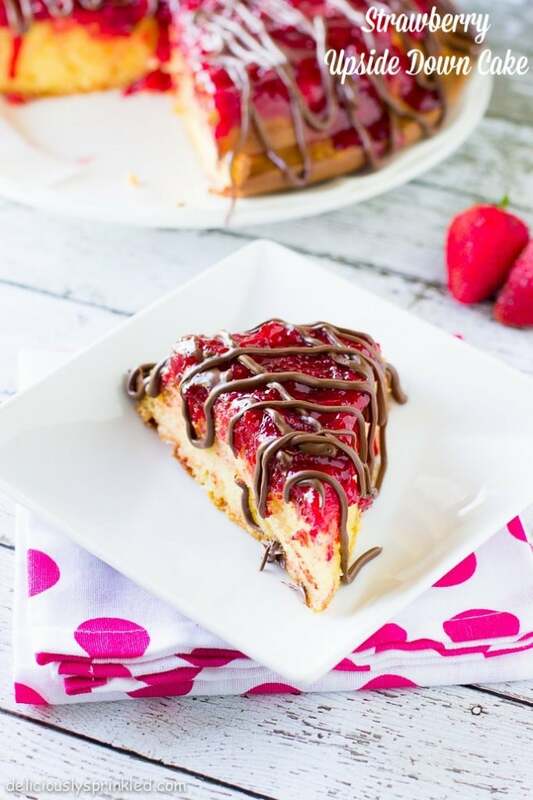 My family said that Strawberry Upside Down Cake will never be the same without a drizzle of Nutella on top, and they were right, it tasted just like one big chocolate covered strawberry. I definitely Spread the Happy to my whole family this 4th of July weekend with this amazingly, delicious cake! This cake is super simple to make, all you need is a box of yellow cake mix, buttermilk, eggs, strawberries, strawberry gelatin, and mini marshmallows. I like to make this cake in a deep pie dish but you can use a 9×13 cake pan as well. Quick Tip: To crush the strawberries, place the two cups of sliced strawberries in a large ziplock bag. Using a rolling pin on top of the strawberries to crush them up. I like to crush some of them up but keep some strawberries in tact because I think it makes the cake look prettier when you flip it upside down. But that’s just me, you can crush them up however you would like! I also used my aunts yellow cake mix recipe for the first time, and I loved it, it’s so simple and it made the cake taste just like homemade. Here is the trick, I started off by using Betty Crocker Yellow Cake Mix, and rather than mixing the cake mix with vegetable oil and water, instead I used 1 2/3 cup buttermilk, you want to use slightly more buttermilk than a direct one-to-one ratio because of the volume of the buttermilk. I then added an extra egg to the mix making it a total of 4 eggs. And that’s it…you now have a cake that taste just like homemade but without all the work and it’s even easier than adding pudding mix, sour cream, milk, vegetable oil, vanilla extract, eggs, plus the cake mix.. like I have done in the past, to make cake mix taste like homemade. But from now on I will be using the buttermilk substitute for all the liquids when using cake mix in my recipes from here on out, the only thing I might add next time is a couple drops of vanilla but other than that this cake was delicious! Preheat an oven to 350F degrees. Lightly spray 9 1/2 inch pie dish or 9x13 cake pan with non-stick cooking spray. Set aside. 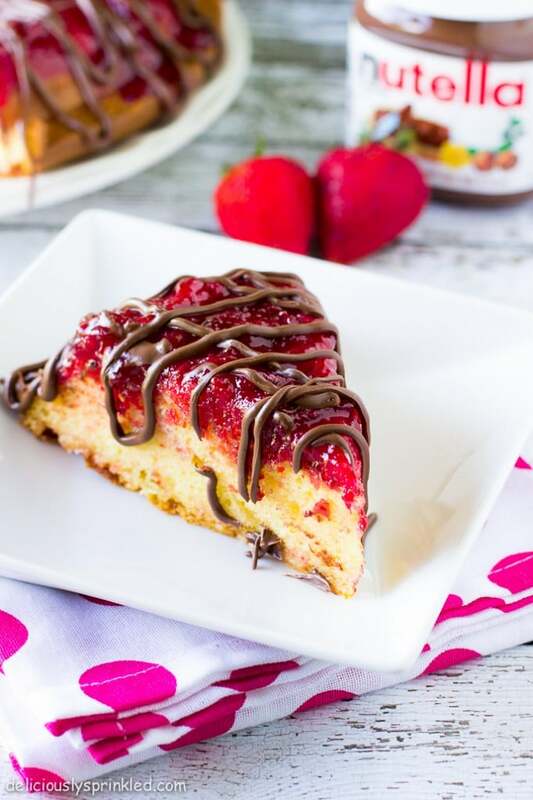 Spread crushed strawberries on the bottom of a pie dish or cake pan. Evenly sprinkle strawberries with the dry strawberry gelatin powder, and top with mini marshmallows. Using an electric or stand mixer, mix together the cake mix, buttermilk and eggs until combined. Pour cake batter on top of the marshmallows. Bake for 40-50 minutes or until toothpick inserted into the center comes out clean. Cool cake in the dish/pan for 15 minutes. Run a knife around the dish/pan to loosen the sides, and turn the cake out onto a large serving plate. Place Nutella in a piping bag or large ziplock bag with a small hole cut on one end, drizzle Nutella on top of cake. *Don’t have buttermilk!? No worries, all you need is 1⅔ cup heavy whipping cream or milk, 1 Tablespoon lemon juice or white vinegar. Stir the lemon juice or white vinegar into the heavy whipping cream or milk, let stand at room temperature for 5-10 minutes. When it’s ready the milk mixture will be thicker and you will see small curd bites. Use in recipe as directed. I would suggest you use the large 13×9 pan instead of pie pan..I tried 10″pie pan n it didn’t hold all the cake mix n I had to try n get it out of pie pan without it mixing…NOT EASY..I ended up putting it in in a 10″ cheesecake pan…..Tasted good tho . my 12year old son loves strawberries. this will definitely be his birthday cake..
My 6 year old grandson requested a birthday cake with strawberry jam in. This looks like it will be a great cake to make. His other requwsr was a dead zombie coming out af it. I’ll have to figuout how to do that. Could you use strawberry pie filling from a can instead of making the mix? Would frozen, strawberries work for this if I thaw them first? Why do we leave all the upside down fun to pineapple? This is such a great idea! This is seriously the greatest invention in the history of mankind! Could there be a better combo of flavors? Totally making this soon! Love it, girl! Oh wow, I definitely wasn’t expecting just 5 ingredients! Looks mouthwatering! Pinned! This cake is all sorts of awesome! What a fun twist on the traditional upside down cakes! This looks incredible! What a great idea for an upside down cake! Gorgeous cake, Jenn! The marshmallows are such a fun surprise in the recipe. This pie looks amazing! Strawberries and Nutella are delicious together! What a great idea for a summer cake! Love this idea, mine is in the oven right now…and smells AMAZING! I wondered if you have tried it using other fruits? I’m thinking fresh juicy freestone peaches, just sliced and maybe made into swirled patterns and with peach jello! I love this cake! So easy and beautiful….definitely making this very soon! What a wonderful way to make an upside down cake! I have never had it with strawberries but it looks amazing! I love the step by step! Great pictures and recipe. I’ve never had an upside down cake because I don’t really like pineapple. This looks awesome especially the Nutella on top! This looks awesome! I love the idea of putting the marshmallows in there! Nutella sure does make everything better!! But honestly I would go crazy for this cake even without the nutella! 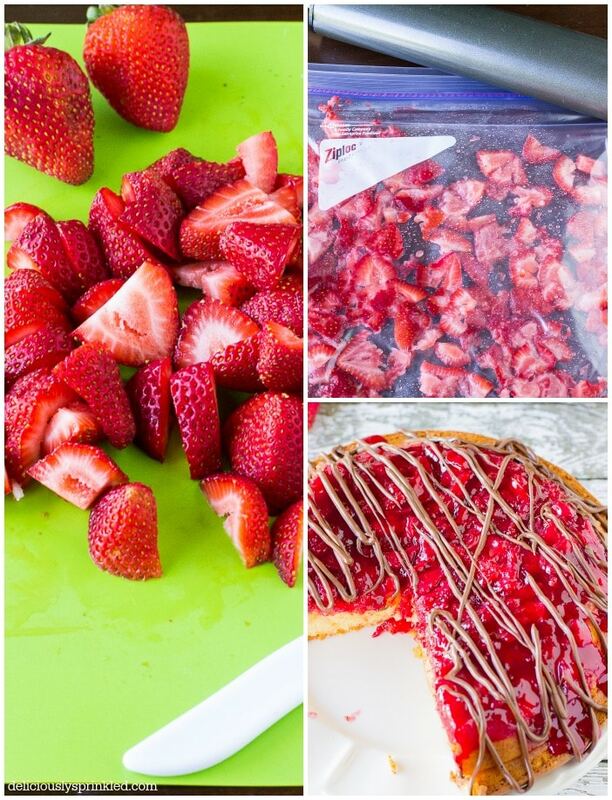 I love this idea of doing strawberry instead of pineapple! What a perfect cake for summer! This cake is gorgeous! And I love the tip on crushing the berries. I always lug out my food processor for things like that, which I hate doing. Now I won’t have to! I saw this on FB and had to come check it out! I LOVE upside down cakes! 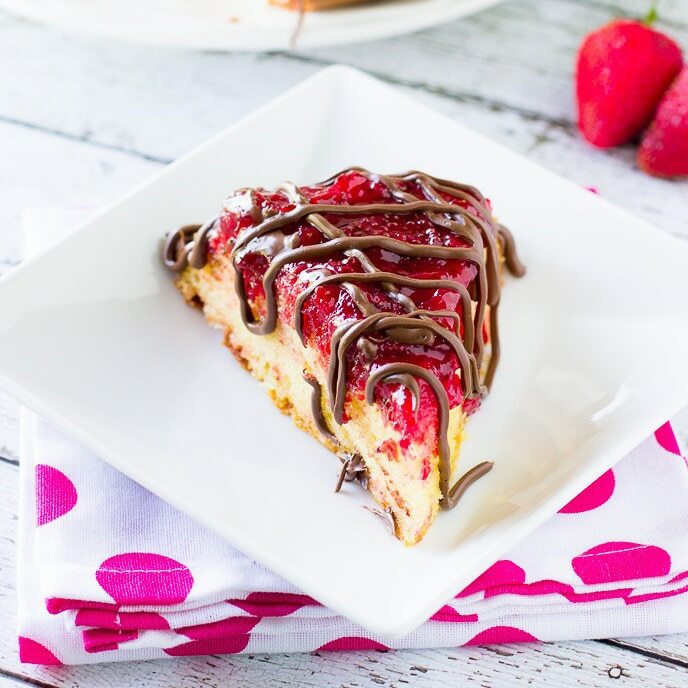 Chocolate and strawberries are a match made in heaven! Yum – love how delicious this looks. I am seriously drooling over this cake!!! It looks amazing!! Love strawberry and Nutella together! Strawberry + Nutella = Heaven!! Thanks for sharing this recipe, Jenn. This cake is so inviting it hurts! And it looks easy, so bonus points! This is a gorgeous cake. I love that you used strawberries. That is something I don’t see a lot.